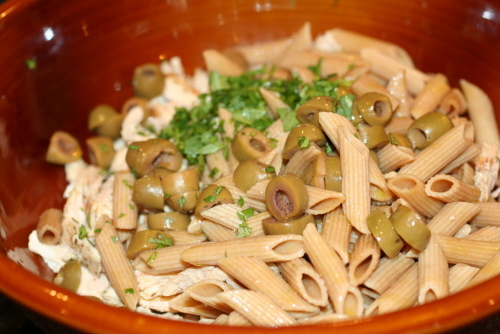 This dish has so many flavors, but I think my favorite is the green olives, they really pop. If you have to omit an ingredient, don’t let it be the olives. Well, or the cinnamon, ginger, and cayenne because they add a special twist that gives it a depth of flavor that is amazing. I am not going to tell you this is a quick and easy dish, but it makes a lot and lasted a few meals for us, plus it is just plain old worth it. Try it out for yourself and decide. Let me know what you think. TIP: Start the eggplant and bean layer at the same time. Cut eggplant up first and start sweating it with sale while you cut onions for both layers. While they are cooking start putting together pasta layer. Place the eggplant cubes in a colander and salt liberally. Let rest for 20 to 30 minutes and then blot with paper towels. In a large saute pan, heat the olive oil over medium-high heat and cook the onions until tender. Add the eggplant. The eggplant will absorb the oil, add more if the eggplant is dry or not crisping up. Cook for 5 minutes on medium heat. Add the garlic, and lower the heat, adding a little more oil, if necessary. Season with salt, and pepper, to taste and cook until the eggplant is tender, about 3 or 4 more minutes. Add the tomatoes and red peppers and cook long enough to warm and force the juices to release. Turn off the heat. Season with salt, and pepper, and set aside. In a large saute pan, heat the olive oil, then add the onions and cook over medium heat until tender and beginning to brown, about 10 minutes. Add the garlic, ginger, cumin, cinnamon, cayenne, and lemon zest (or juice) and cook until fragrant, about 1 minute. 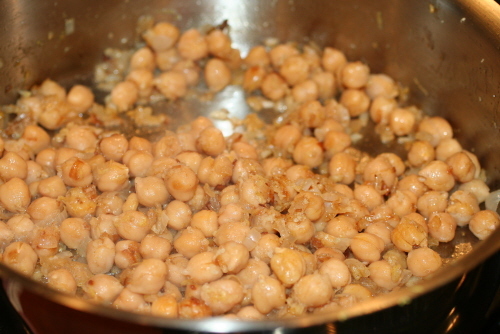 Add the chickpeas and stir to coat. Turn the heat up to high and deglaze the pan with the wine or chicken broth. Remove the pan from the heat, season with salt, and pepper, to taste and set aside. 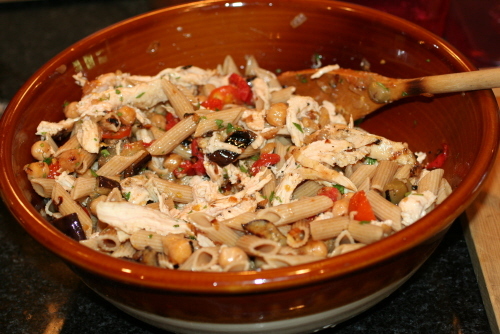 Place the pasta in a large serving bowl. In a small bowl, whisk together the olives, cilantro, oil, vinegar, and salt, and pepper to make a light vinaigrette. Drizzle the dressing over the rice and toss to coat completely. 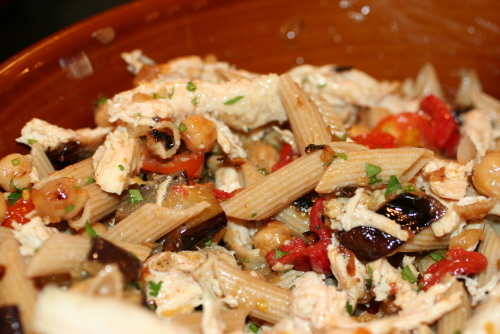 Take all ingredients and pour on top of pasta mixture into large serving bowl. Toss gently to coat. In a large saute pan, heat the olive oil over medium-high heat and cook the onions until tender. Add the eggplant. The eggplant will absorb the oil, add more if the eggplant is dry or not crisping up. Add the garlic, and lower the heat, adding a little more oil, if necessary. 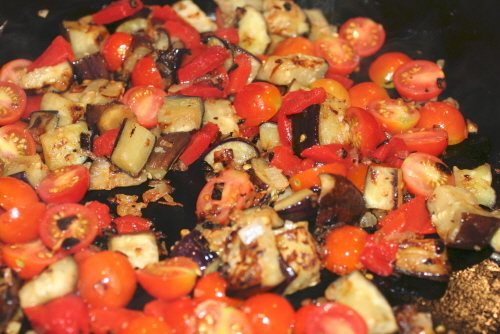 Season with salt, and pepper, to taste and cook until the eggplant is tender, about 3 or 4 more minutes. Add the tomatoes and red peppers and cook long enough to warm and force the juices to release. Turn off the heat. Season with salt, and pepper, and set aside. In a large saute pan, heat the olive oil, then add the onions and cook over medium heat until tender and beginning to brown, about 10 minutes. Add the garlic, ginger, cumin, cinnamon, cayenne, and lemon zest (or juice) and cook until fragrant, about 1 minute. Turn the heat up to high and deglaze the pan with the wine or chicken broth. Remove the pan from the heat, season with salt, and pepper, to taste and set aside. In a small bowl, whisk together the olives, cilantro, oil, vinegar, and salt, and pepper to make a light vinaigrette. Drizzle the dressing over the pasta and toss to coat completely. I like to serve this summer pasta dish with Rosemary Chocolate Chip Shortbread.